The +/- grading policy was voted on by Faculty Senate on Feb. 21, 2019, and the policy failed. We will try to keep this page up to date as more information develops. Q: Will this policy change grade awarded prior to implementation? Student Council voted on a resolution to oppose the current plus minus grading policy proposition. 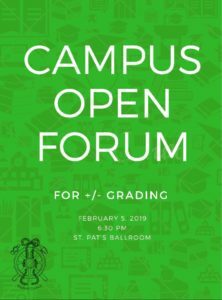 Student Council will be hosting a Campus Open Forum for +/- Grading at 6:30 PM in St. Pat’s Ballroom, minutes of it can be found here. Student Council had a general body meeting where students voted that we should have a resolution to oppose the +/- grading scale.